We woke up on my birthday to a drizzly, grey sky. Neither of us felt like biking in the rain, and according to my map, there were not many places to stop between Lago Agrio and Quito. It would have taken us three days of climbing to get to Quito, which sits at an elevation of 2850 meters. Over breakfast at the corner bakery, we decided to try hitchhiking to Quito before spending the $24 on bus tickets. We rode back in the direction of the church where we tried to stay the previous night, in the light rain, to a gas station on the outskirts of town. Hitchhiking requires patience, and we were mentally prepared to be waiting there for a while before we found someone who would agree to take us in the right direction. Luckily, the first person we talked to offered us a ride almost all the way to Quito! Carlos had a new-looking, spacious SUV that easily fit both of our bikes in the back. 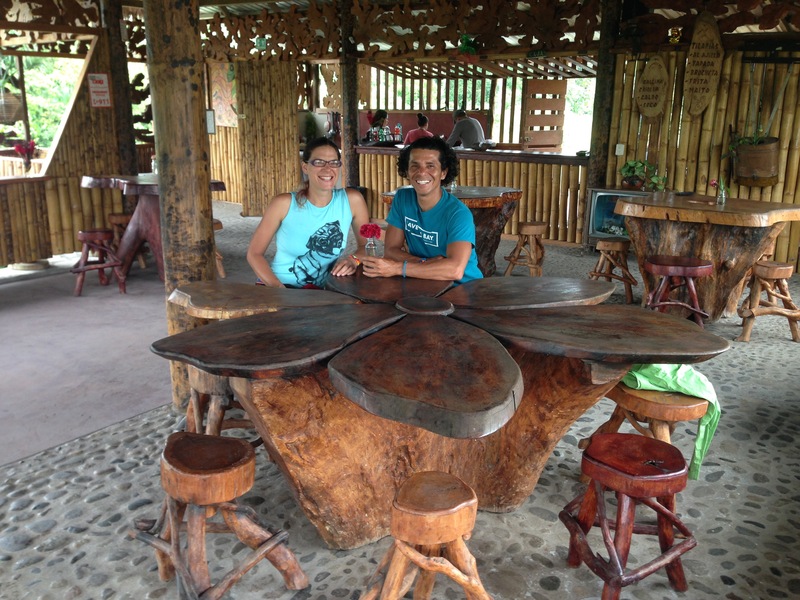 Before leaving Lago Agrio, he stopped at a restaurant furnished with beautiful handmade tables and chairs, that the owner had made himself from local trees. Lenin and I shared the local specialty of the season, which was a fish wrapped in banana leaves and grilled over charcoal, accompanied by a tea called guayusa. While waiting for our food, the restaurant owner invited us to look around his house, which was next door and full of beautiful hand-crafted furniture that he had created. The drive towards Quito took several hours and winded through beautiful jungle as we climbed in altitude. The first hour or so was relatively flat, but once we began climbing, it was very curvy and would have been a tough ride with our loaded bikes. We passed several waterfalls and enjoyed many scenic views across the valley from the mountains we were on. Halfway through the drive, Lenin, who had been sitting in the back seat, had to get out to vomit. We switched places after this and continued on along the twisty mountain road, stopping just once more to use the bathroom and try some homemade ice cream. From where Carlos dropped us off, we had a quick ride downhill to get to the Casa de Ciclistas, which was actually just outside of Quito in a town called Tumbaco. We arrived just before sunset, and Santiago welcomed us onto his ample property, which is contained behind a wall. Within the wall was a white, two-story house, a laundry area, bathroom and shower across the courtyard, two garage-sized buildings behind the bathroom/shower/laundry, and several avocado and guama trees. The home had a spacious living area on the first floor that included a piano. The kitchen and stairs to the second floor had separate entrances from the house, as well as a room where Santiago’s mother lived. There were already 5 other bike tourists hanging out in one of the garages. Four of them were from Argentina, and one was from Belgium. Another cycling couple from England had also been staying there for the past week, but they were out getting dinner when Lenin and I arrived. For dinner, we walked a few blocks to an artisan pizza place, and on the way back we stopped to buy an ice cream cake to share with the other travelers. Where Lenin and I stayed on the second floor, there were two other rooms and a bathroom. The property could accommodate a lot of travelers, and Santiago didn’t charge anybody to stay there. He even wanted us to stay longer than the two nights we stayed. Posted on 5 April 2017, in Bicycle Touring, Colombia and Ecuador and tagged bike house, bike touring, bike travel, bikepacking, ecuador, hitchhiking, lago agrio, quito, travel. Bookmark the permalink. 2 Comments. Thanks, Charlotte! I will read that tonight!